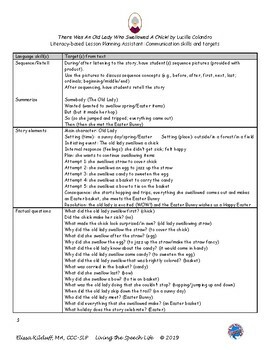 Thank you for downloading our Literacy-based Lesson Planning Assistant for Speech and Language for the book There Was An Old Lady Who Swallowed A Chick! 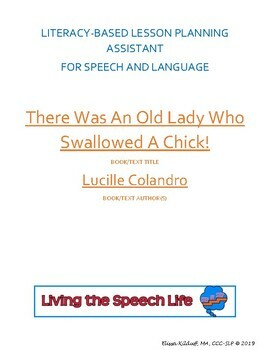 written by Lucille Colandro. 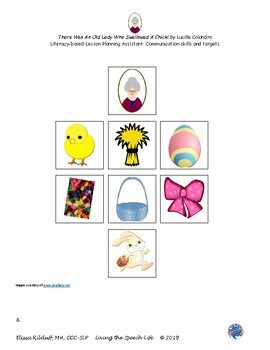 This product outlines many of the articulation, speech fluency, and language skills that can be addressed with this text. 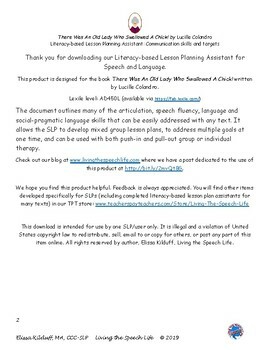 It allows the SLP to develop mixed group lesson plans, address multiple goals at one time, and be used with both push-in and pull-out groups or individual therapy.